Amateur Catholic is on hiatus, with the demise of BlogRolling and lack of time to investigate an alternative we are down for the time being. Steven on behalf of your amateur hosts. To read in all types of the weather. To come and begin it. So click on the link for some treasure. Tonight, I will be blessed to see firsthand the good works of the Catholic Church in Lebanon, Syria and Jordan. I will be visiting families living in refugee camps, dozens of beautiful churches and even an olive press business founded in a poor farming community with the help of Catholic Near East Welfare Association (CNEWA), the organization I work for. Then please subscribe to my blog (gabedelmonaco.wordpress.com), friend me on Facebook, or follow me on Twitter (@GabeDelmonaco). Please also provide your users with my information—I want to spread the story of the Church’s good works with as many as I can! I really enjoy writing about the striking differences between the places where CNEWA works and the U.S. —and just as importantly, learn what we have in common. I blogged about my recent trip to India, too. Take a look! If I request membership and you all accept, can I borrow some cash? Seriously though, what are the requirements, other than broke and aspiring, and are their any commitments? I am very happy to let you know that our very first podcast at podCatholic.com is live! Do check out the site & listen to the podcast - either on the site or by saving on your computer for later / your iPods etc. Your suggestions to improve are welcome, your prayers for this our new ministry are appreciated. I am new to the Catholic Church and to blogging, but I am giving it my all! My blog is Senttobe.blogspot.com I write from the perspective of a Mom, former protestant pastor, theologian's spouse, but mostly my love for the church. Technically speaking, I am an Amateur Almost-Catholic blogger. I am a candidate still in RCIA but, as of today, have 2 more weeks until I am received. I love the concept for the B-Team and it certainly describes me (other than the arguably Catholic part). Please sign me up, issue my membership card, disclose the secret handshake, and add me to your distinguished B-Team member roll! Catholic on my joyfulpapist.wordpress.com blogsite. some of which may even be right. Please, please can I be a B-teamer. I would like membership in the blog... I truly am an amateur, I just began fooling around with this stuff and I can barely write. I already have the badge and blogroll on my site, I figured I am so amateurish there was no way I would be denied membership LOL. Anyway what I really want to know is how do I get the blogroll with the scrolling bar? My blog is St. Monica's Tears, the description follows. This blog has two purposes. The first is to share my journey of continuing conversion toward the peace and joy that is found in knowing, loving and serving the Truth which is Christ Jesus and subsists fully within His Catholic Church. The second is to share the pain, sorrow and tears for my sons who have fallen away from the true faith of Jesus Christ and to encourage and support others who carry this same heavy cross. http://www.livecatholic.net/ I'm on a mission to help other Catholics, or those interested in Catholicism, discover the resources that will help them learn what the Faith really teaches, and how to deepen it, so they can find union with God. Thanks so much! I am definitely a teur! It's one word? Ok... good, because I had no idea what a teur was, but didn't want anyone to make fun of me for not knowing! But really... I am an amateur. I went to a Catholic law school where I knew all 300 students names, and yet I get about 15 blog hits a day. Sometimes my wife doesn't even read my blog. So I definitely think that makes me an amateur. On top of that, I really like the colors of the logo, and think they would look nice on my site. 10 Common Misunderstandings of the Catholic Church EXPLAINED! I know this email is out of the blue, but I just posted an article on my blog entitled “10 Common Misunderstandings of the Catholic Church EXPLAINED!” Anyway I figured I’d bring it to your attention in case you thought it interesting enough to drop a quick mention on your site about it as I’m trying to increase readership of my blog. Either way, sorry for the unsolicited email and hope you have a good week. I am interested in joining your blog roll, if you are accepting new members. I have been blogging since August and am a member of Catholic Mothers Online. You can visit my blog at the address below. I hope you will except me as a member. Most esteemed Amateurs, I humbly request your recognition as an official member of the B Team. If I may be so bold, I would like to apply as a Professional Amateur. I know my pride seems to walk before me in making such a request, but I do so because I was, for a time, a professional Catholic. For seven years, I studied for the priesthood and was a member of a religious order. And so, while I was not paid well (temporally speaking), I made large investments in my Professional Amateur Catholic future. Now, I've lowered myself to pursuing a degree in law, but with a sense of humor as much of a Catholic sensibility as I can. I'm also a husband and father of three, though we lost two of them too soon. I started a blog during Lent this past year and revamped it this fall. The blog is todustyoushallreturn.wordpress.com. Now moved to http://catholicbookreport.wordpress.com/ Stop by and look around. I write about a variety of things, but mainly about seeing things through a Catholic lens. It's a nice respite for me from the drudgery of law books. I hope it provides the same refreshment for you. We began blogging last December. We take no money from anyone and are happy to be subservient as instructed by Our Lord, So with the utmost of humility, we (The Stranger & I) seek, no beg, or rather plead for membership in your most prestigious organization. Stranger in A Strange Land. I am not a fan of predestination, being Catholic and all, but oh man, this whole letter B thing has got me feeling like a player in a vast right-wing conspiracy. I was Born a Baby Boy in Buffalo, Baptized at Blessed Sacrament, was a Boy scout, a B student, love the Bills and hate the Bengals, love B movies, Beethoven and the Blues Brothers, my favorite colors are Blue, Brown and Beige, am a wee Bit Big in the Belly, and I love Blogging. Can I Be on your team? Not to Be a Big Baby and bring in a Brouhaha, But don't Be Brutish - I want in! Seriously, I would love to be on the B Team - let me know! I am looking to add the Catholic Dads site. A lot of the Catholic Dads members (including yours truly) are Catholic B-Team members. Heck, half of the amateur hosts are Catholic Dads members (which reminds me – don’t forget to update your links to the new site). Thus I argue that Catholic Dads has a preponderance of amateurity (which is not an “official” word, but should be). 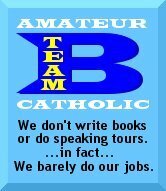 I humbly ask that the Catholic Dads site be added to the Amateur Catholic list and that we be allowed to proudly display our Catholic B-Team badge on our site. I'm addicted to my faith and addicted to blogging. So far I'm explaining some aspects of our faith and how it personally affects me. I don't put anyone down in my blog, and I don't put up with any put downs on Catholics either. Please add me, I'm definately ametuer material. Did I spell that right? BTW I didn't get no college degree. My name is Brian - I am Roman Catholic - Husband, Father, candidate for the Permanent Diaconate. I am a new blogger, created the blog in April. I have created blogs before, but old template, and not very good.. My blog is named "A Book of Everything." It is a Catholic blog where everything can go. Things of family, life, music, politics, and some ranting. But most especially, things of God! It is my "little way" of evangelizing. I would like to become a member - when given permission, I will paste your widget to my blog. I am definitely a B-Team Catholic. Although technically I'm a paid youth minister, the size of my salary certainly doesn't qualify me to be a professional. I guess I would be considered a Professional Amateur, sort of like Single-A Baseball. I would love to be considered for membership to your site. The name of my blog is "Salvation Is An Adventure" and the site address is http://timburke74.blogspot.com.